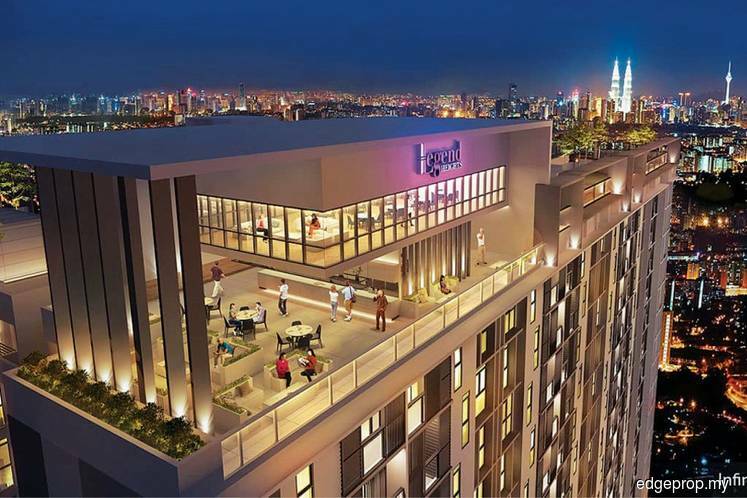 KUALA LUMPUR (Oct 6): JL99 Group plans to soft launch its latest residential project called Legend Heights at Taman Sri Segambut, near Kepong, Kuala Lumpur on Oct 7 and 8. Located on a 2.91-acre leasehold site in the heart of Taman Sri Segambut, Legend Heights is the first high-rise serviced residential development in the vicinity. “Taman Sri Segambut is a very mature community that comprises mainly 1-storey terraced houses and old neighbourhood shoplots. Legend Heights is the first high-rise residential project there, hence the name of the project,” said JL99 chief operating officer Dan Yap. He told EdgeProp.my that Legend Heights consists of two 40-storey blocks with a total of 558 serviced apartment units and 14 shop units. The project has a GDV of RM300 million. The serviced apartments come in three built-up sizes of 1,050 sq ft, 1,215 sq ft and 1,350 sq ft. All units come with at least two car park bays. The selling price starts from RM450 psf. The project offers 19 facilities on Level 8 and the rooftop on Level 40 including an infinity pool, kids’ pool, Jacuzzi, aqua gym, signature deck, multi-purpose area, gym room, private lounge, playground, kids playroom, maze garden, leisure lawn, sky zone, infinity lounge and sky garden. The 14 street-front shoplots are located at the rear of the project and therefore will not be sharing the same entrance to the serviced apartments. “We will be renting out the shops. Eventually, they will be passed on to the management corporation to manage and decide on the tenants. The rental income generated will go back to the project itself. This is why we can keep the maintenance fee as low as 22 sen psf including the sinking fund,” Yap said. He added that business owners who were originally doing business at the project site will have the priority to rent the shops. JL99 is also building a public basketball court and community hall next to the 14 shoplots. “If you are familiar with this area, you will know it is a very community-based area where the old folks will gather at the coffee shop almost every day to chit-chat. We don’t want to change the lifestyle here and want this lifestyle to be enhanced, so we are building the community facilities,” said project marketing executive Celine Lee. While there are many new residential projects in Kepong, Yap believes Legend Heights has its niche market. “Our target market is clearly in this neighbourhood — parents who are buying for their next generations, young working adults who are buying their first home near to their parents as well as newlyweds, so the built-ups shouldn’t be anything smaller than 1,000 sq ft,” said Yap. “Then we look at how much they can afford. I think in this current market, RM450 psf is pretty attractive,” Yap noted. That seems to be working. Some 60% of the units have already been booked, with 40% of them sold as at end-September. The majority of buyers are from the vicinity. “They love this project because of its location. There are many new projects in Kepong today, but Legend Heights is aimed at those who have been staying in Taman Sri Segambut for years and have no plans to move to the more congested Kepong town centre,” Yap noted. Legend Heights is accessible via Kepong, Menjalara and Segambut. It is 2.9km away from Kepong, 5km from Desa ParkCity and 9km from KL city centre. There are also two mass rapid transit stations (Kepong Baru and Jinjang) and one KTM station (Segambut) located within a 3km radius from the project. The project is slated for completion by mid-2020.